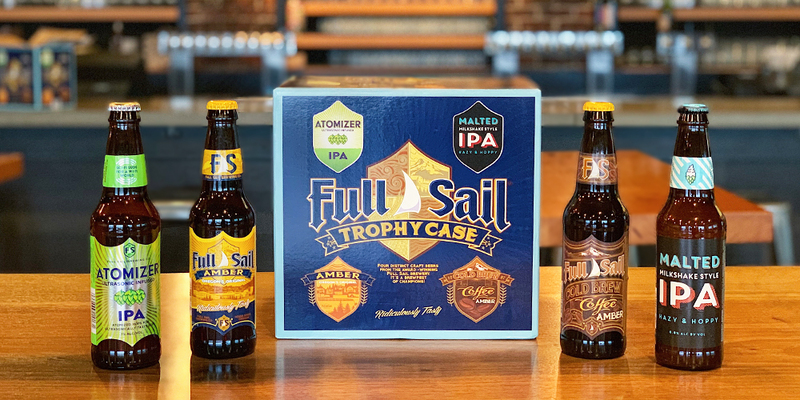 Our latest Trophy Case release is stocked with our flagship Amber Ale and three brand new craft beers for you to explore. Full Sail Amber Ale: The brewery’s flagship and Oregon’s original amber. Brewed with 2-row Pale, Crystal and Chocolate malts along with Mt. Hood and Cascade hops, its a malty sweet, medium bodied treat with a spicy, floral hop finish. Over the years our flagship Amber has earned many awards and accolades including over 25 gold medals and was named “World’s Best Dark Beer” at the World Beer Awards. Full Sail Atomizer IPA, developed with a high-tech, top-secret, hop infusion method to deliver enhanced aroma and flavor into this balanced, unfiltered, hoppy brew. A combination of Cryo Citra, Mosaic, Simcoe and Ekuanot hops make Atomizer IPA ingeniously flavorful. Malted Milkshake-Style IPA: Big juicy flavor and big juicy hops stand out in our new Malted Milkshake-Style IPA brewed with Ekuanot, Denali, Comet, Citra, and Cascade hops. We used 2-Row Pale, Wheat, and Oats along with lactose that provide a full-bodied, smooth creaminess. A touch of natural vanilla is the proverbial cherry on top. Cold Brew Coffee Amber: We took our award winning Amber Ale to a whole new level of complexity by blending it with cold brew coffee. This cold brew coffee infusion enhances Amber’s noteworthy malty sweetness and imparts aromas and flavors of mocha, coffee, chocolate and vanilla. This limited edition brew is only available in the Trophy Case and draft. The Trophy Case variety 12-pack is available year round with a new rotating brew each season.